Homeownership can be one of life's joys -- and also an ongoing headache and stress point. Home insurance in Ohio also means protecting your home against weather-related disasters like blizzards and below-zero cold snaps. Like any state, home insurance rates can vary greatly depending on your community, but did you know that you might be paying double than your neighbor? Insurance companies charge different rates, so you need to make sure you're shopping around to get the best deal. On this page, we'll provide Ohio home insurance rates by coverage level, ZIP code and by Ohio homeowners insurance company. We'll also review how much other Ohioans are paying for their home insurance. You'll additionally get to see if there is an opportunity for you to save on your home insurance. 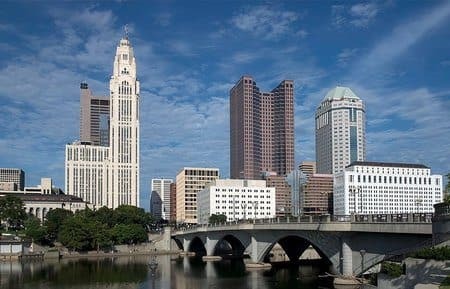 How much is homeowners insurance in Ohio? The average home insurance rate with $200,000 dwelling coverage that includes a $1,000 deductible and $100,000 liability is $864, which is 30 percent cheaper than the national average. That's a $364 savings. Another important piece of home insurance is the deductible. A deductible is what you have to pay before an insurance company pays your claim. So, let's say a fire caused $20,000 worth of damage. If you have a $1,000 deductible, you will pay that and the insurance company will pay the remaining $19,000. Choosing a deductible plays a role in your premiums. The higher deductible you choose, the lower your premiums. It's a good idea to choose a higher deductible, but make sure you have enough money set aside to pay that amount if you need to file a claim. A second way that insurers figure out a deductible is basing it on a property's value. Instead of affixing a dollar amount, an insurer may make the deductible a percentage of the home's value. So, if your home is worth $400,000 and you have a 2 percent deductible, you'd have to pay $8,000 before the insurance company pays the claim. Your community plays a role in how much you pay for home insurance. Areas that have more claims will likely cost more to insure a home. All of the most expensive ZIPs are near the Kentucky border. Insurers feel that area is riskier to cover. It could be for many reasons, but the main denominator is that homeowners in the area likely file many claims. The least expensive ZIPs are spread throughout Ohio. They're all in suburban areas, but in geographically different areas. Now that you've seen the most and least expensive areas and those of the big cities, let's dive into your ZIP code. You can enter your ZIP code into the search box at the top of the table below. You'll find the average home insurance rates for your ZIP, as well as the range of what home insurance companies are charging. The average rate is $735, which is cheaper than the state average, but you'll see there's a range of $582 to $1,044 depending on the insurer. So, in this case, you may pay nearly double for home insurance in Cuyahoga Falls depending on your insurer. It pays to shop around. Who has the cheapest Ohio home insurance? Below are home insurance rates by company for six coverage sets. Based on our rate analysis, you’ll see Allstate has the most affordable rates for the coverage levels analyzed. Much like any other type of consumer purchase, buying home insurance should be a shopping experience. Don't just go with the same one as your parents or the one that you've had since college. As we saw above with Cuyahoga Falls, home insurance costs can vary depending on the insurer. To be a top home insurance buyer, make sure you get at least three quotes from home insurance companies. Your first step should be figuring out the coverage level and deductibles that you want. You can then see what companies offer home insurance in your area. Once you know your options, check out Insure's Best Home Insurance Companies, so you're comfortable with the home insurance companies. Then get at least three quotes for the same policies. Also, remember the cheapest company isn't always the best. Here are how major home insurance companies in Ohio rank overall for claims handling, customer service, value and renewal recommendation, based on a 2017 survey of 3,160 customers. Scores out of 100. Flood insurance is not part of a normal home insurance policy. Instead, you need to buy a separate home insurance policy through the National Flood Insurance Program (NFIP) or an insurer that works with NFIP. Flood insurance rates are standard, so you don't have to shop around. You'll pay the same amount for flood insurance for your property regardless of company. You might think that you don't need flood insurance because you don't leave near a major river and you're not in a flood zone. Your home may still be at risk. The Federal Emergency Management Agency estimates that the average home insurance policy costs about $700. The exact price depends on your home's risk, the location, type of coverage and deductible. Depending on your risk and factors, you may find a policy less than $200. If you want flood insurance, you will need to have it for 30 days before it takes effect. This means you can't wait until potential flooding is on the way to take out a policy. Earthquakes are not usually synonymous with the Buckeye State. In fact, a major quake hasn't hit Ohio in more than a century. Ohio does get hit by smaller earthquakes though. Most home insurance companies serving Ohio offer earthquake insurance. Premiums are low, but the earthquake deductible ranges between 2 percent and 5 percent. That means you'd have to pay that percentage before the insurer pays for the rest of the damage. The Ohio Department of Insurance said brick and masonry homes are more likely to get damaged during a quake, so you'll have to pay more for covering those types of homes than a frame house. Ohio winters are rough and your home may take the brunt of it. Winter is a common time when Ohio homeowners need to file a claim. Though insurance companies will likely help you repair damage from the events above, they might think differently if it's an ongoing trend. Insurers expect you to correct problems. So if you have a leaky roof, they presume you will repair it and not file more claims in a year. If you don't correct an ongoing problem, they will likely increase your rates and may even drop you. Insurance companies don't like taking on risk. If you file too many claims, an insurer will feel you're too risky and look to offset that risk either by increasing rates or not renewing your policy. What if no insurer will cover me? If you can't find home insurance, the Ohio FAIR Plan Underwriting Association will help you. But make sure it's the last resort. The FAIR Plan is similar to any other home insurance policy. A FAIR Plan covers you for fire, vandalism and other damages. The FAIR Plan may cover your home when no one else will, but it's not a guarantee. The association will inspect your home to determine whether you're eligible for overage. One word of warning: FAIR Plans usually cost a lot more than standard home insurance, so make sure you do all you can to get a plan through a regular home insurance company before inquiring about a FAIR Plan. There comes the point in every homeowners' life when you have to file a claim. Your house may have caught fire, your burner may have filled your home with smoke or a tree may have crashed through your roof. Whatever the case, you need to take similar steps to file a claim. First, notify your insurer as soon as you can. If the home is damaged, make temporary repairs that protect against further damage. For instance, if there's a hole in your roof, patch your roof, but don't completely redo the roof. Keep all damaged property so the insurance adjuster can review. Also, take photos of the damage and write down what happened, so you're prepared when you need to offer that detail to your insurance company. An insurance adjuster will visit the property and check out the damage. If you need to file a complaint, contact the Ohio Department of Insurance Consumer Services Division at 1-800-686- 1526. A representative will discuss your insurance rights and how to file a complaint. You can also find out more on the Department of Insurance Complaint Center. Before you contact the state, make sure you have the insurance company's name, policy number, claim number and any other documents, such as letters and photos. The state representative may ask questions about that information, so it's important you're prepared and don't have to call back.